Last month, we were in one of my favorite cities…NYC. My husband took me on an impromptu date night to the funnest little jazz joint, and I went out of my comfort zone and ordered off the menu, no questions asked...and fell in love with this delicious little French salad! Here’s my recreation of it with a dijon-free, sweet lemon vinaigrette. I also added some seared brussels sprouts, just because I love a bit of something warm in my salads in December. If you’re like me and can’t seem to find Frisée locally, you can substitute with Endive. Or, if like me, every bunch of Endive you’ve found is NASTY for some reason, Green Curly Lettuce and Arugula work as a swap as I’ve done here. 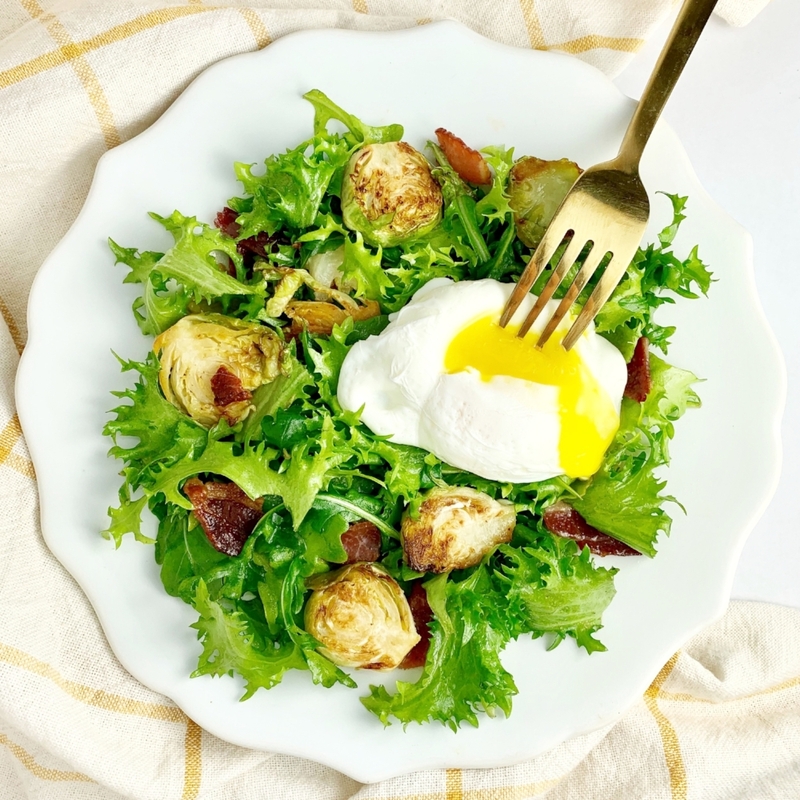 The poached egg is definitely an AIP reintroduction, but the good news is the salad is still delicious without it! It would be great with a few slices of avocado in place of the egg as a great source of healthy fats! In a large skillet, cook the bacon.When done remove the bacon and crumble into large pieces. Leave the rendered fat behind. Set the bacon aside. Remove the stems from the brussels sprouts, and cut into thirds or thinner if the sprouts are large. Toss the brussels sprouts with the sea salt and garlic powder. Heat the bacon fat and add the brussels sprouts. Cook on both sides until tender and they begin to crisp a bit. If the skillet gets too dry while cooking, add a couple tablespoons of water. In a large bowl, toss together the Frisee, Arugula, brussels sprouts, bacon, and 2-3 tbsp dressing.